The only handprint turkey I've ever been excited over! 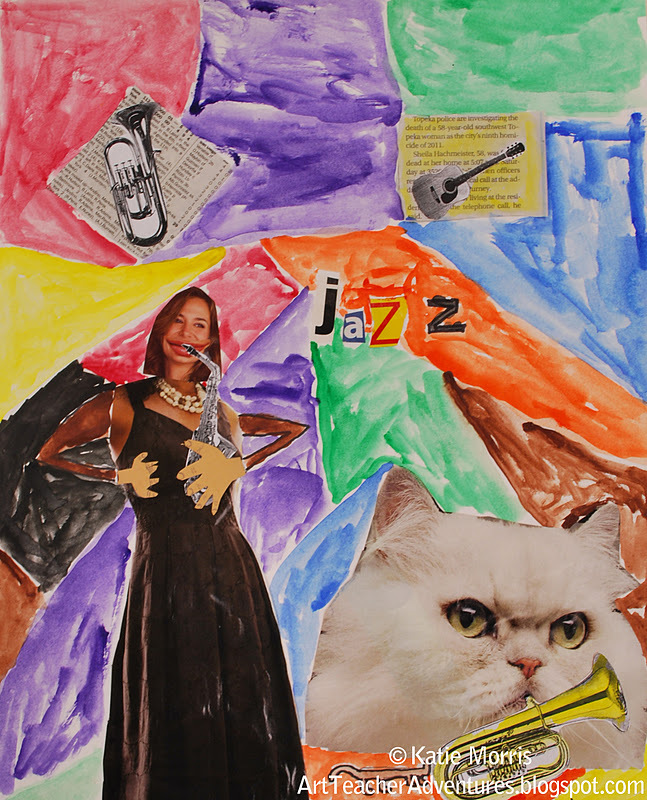 My 5th grade students made artwork inspired by Romare Bearden. I had thought about doing a project inspired by him since I started teaching but hadn't found just the right inspiration yet. I read that the Nelson-Atkins Museum in Kansas City was having an exhibition of his work, Romare Bearden stamps were being released, and his 100th birthday would have been last September so the timing seemed right. To begin the project, I showed a PPT (from a website that apparently no longer exists). 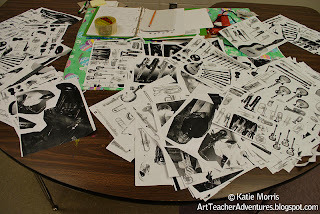 The students discussed some of the artwork and I pointed out how he assembled his images from different materials. I really emphasized that he used images to construct NEW pictures instead of just cutting and pasting whole images and that the scale did not have to be "correct." I also showed the following video because I liked how they compared improvisation and play between jazz and Art. 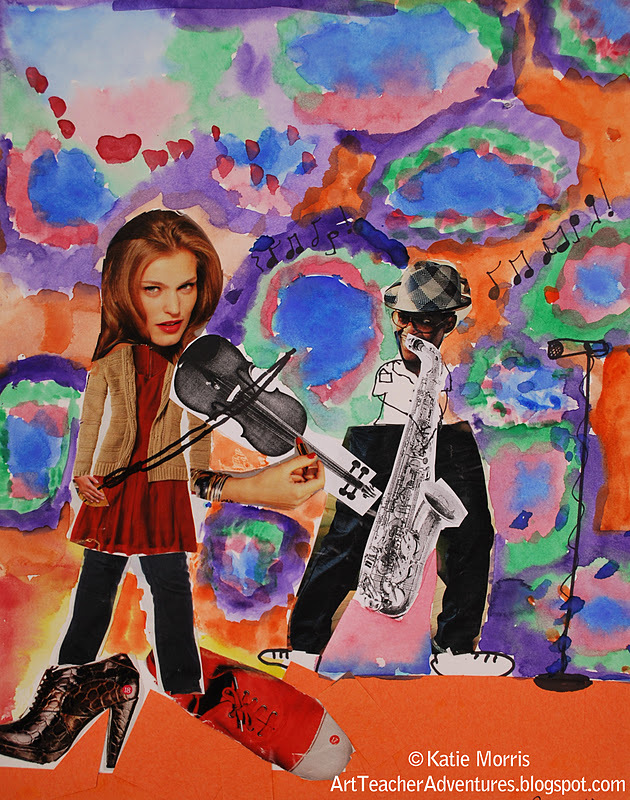 The assignment requirements were to create a mixed media work of Art about music. 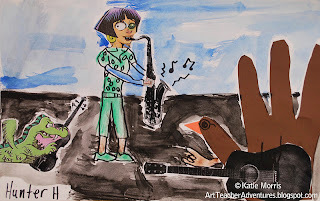 The students had to include something cut from newspaper or magazine (or both), something cut from construction paper, something hand drawn, and at least one instrument from the collage sheets I created. To make the collage sheets, I asked our music teacher to save catalogues for me. I went through and cut out tons of pictures of instruments then laid them out on the copy machine. 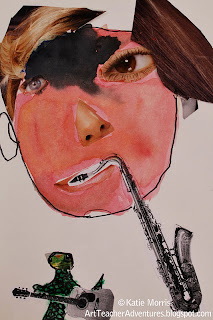 I did not group the instruments by type (woodwinds, brass, percussion, etc.) though that might have made it easier for students to find specific instruments they were looking for. 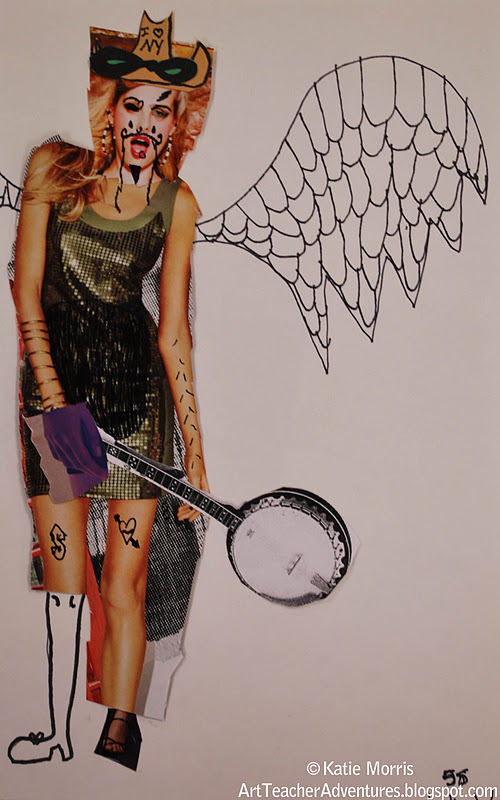 I put them together however they fit on the copier and enlarged to create different sizes. I thought we could do this project in 2 class periods, and some were pretty much finished in that amount of time. However, I did add a 3rd class to the schedule to let more finish, and several students asked to come in during recess to work on their projects. I think that's a sign of a popular lesson- students giving up recess! In the 3rd class period, students used watercolors to fill in white space, and wrote an artist statement when they were done. I did my art to represent Romare Bearden art. I was inspired by his art. He is a great artist. I found out about his art by Mrs.Morris, she showed us his art on the internet and thats how I figured out, and why I did it. I really liked the way this came out. Better than I imagined it! I didn't want to just paint everything, I wanted to make it colorful. Some things, as you can see, I made them so you have to think about. Like the girl playing the violin. That's her left hand. Thanks for reading this! 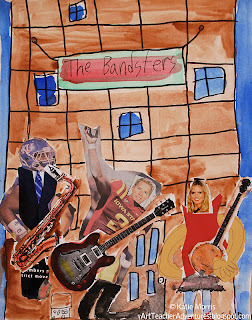 This student said her band was named "The Toasters". I didn't notice they were missing the 2nd "t" until last night. I love this one. I wish he hadn't missed the last class so he could have finished. I like the watercolors on this face. 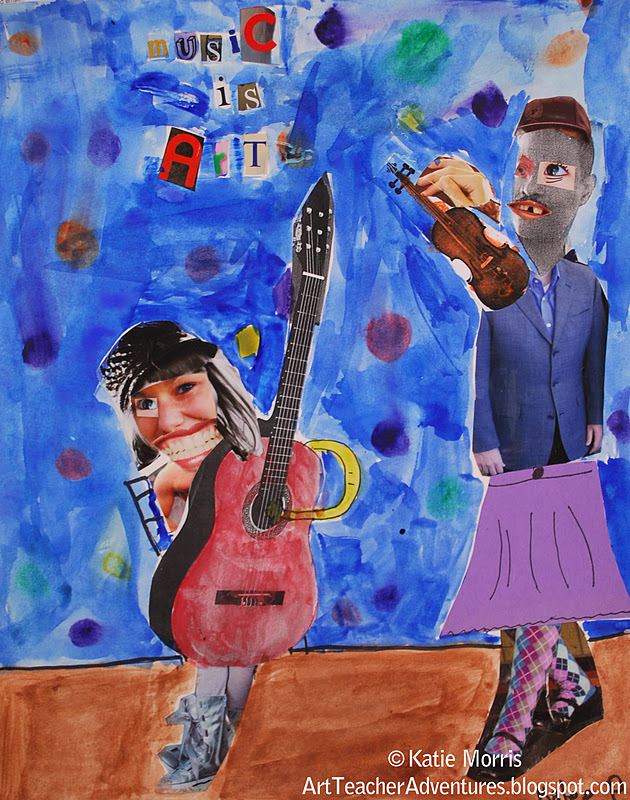 "Music is Art" became a popular phrase to add to the projects. 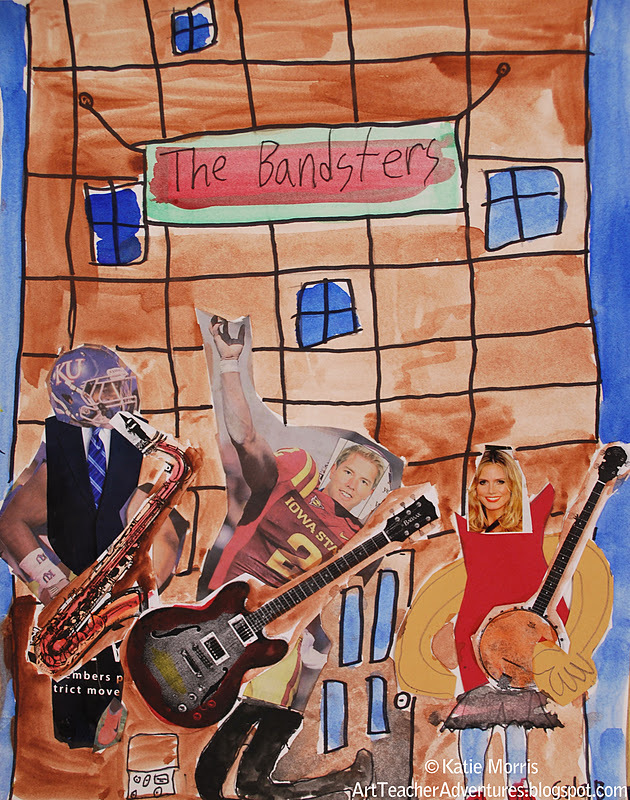 This student named his band and put thought into their environment. I made a jazz collage with pencil, paper, magazines, and paint. I learned that almost everyone can be artistic. I like my picture and think the best part are the players. Questionable placement of the lady's hands but unintentional. I like how the fingers were cut out and put over the sax. I REALLY love this project! Brilliant! 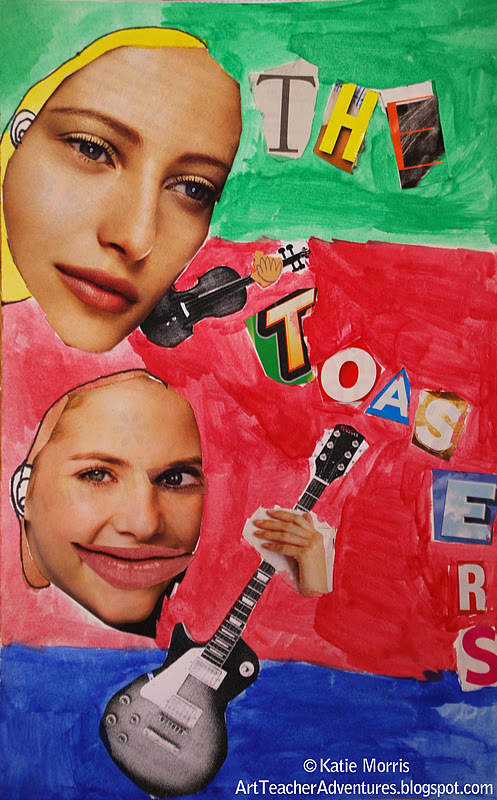 I bet the kids loved combining the images to create their masterpieces! They really turned out great! 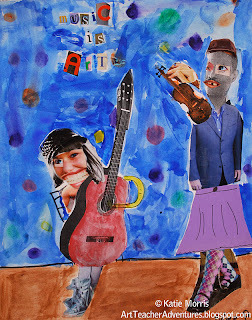 And I LOVE the integration of art and music! I am going to talk to my music teacher about collecting images and doing a music/art group project! SO COOL! These are great, Katie! 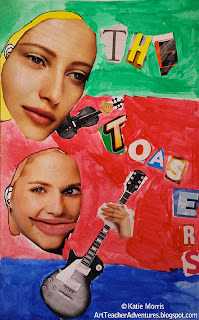 I'm noticing how a few art teachers are personalizing the kids artwork by using photographs. I love this idea! Thanks for sharing. These are great! I tried to go on your powerpoint (or smartboard if you have it), but the link was disconnected. Could you email it to me? 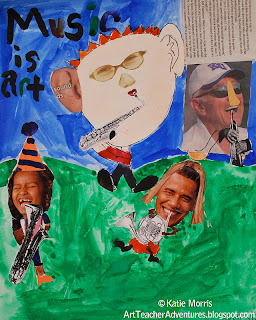 poppyraineart@gmail.com I would love to do this with my 4th graders. We just finished a painted paper guitar w/ circle weaving after studying Picasso. This would be a great lesson to use after the guitar lesson. Thanks! The PowerPoint I used was from another school district's website- I think I found it from Pinterest originally. I don't think I saved it, just showed it from there so unfortunately I can't send it to you!